Discover the rich taste of Colombian java with this travel-friendly, 24-pack instant coffee cube set. Discover the rich taste of South American java and raw, unrefined cacao with this 24-pack instant coffee cube set. 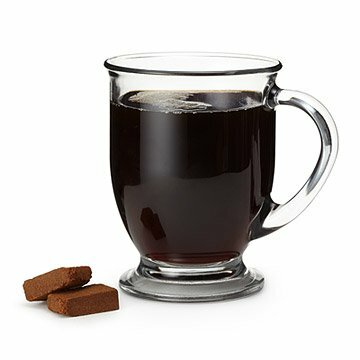 Sourced from the mountains of the famed Ocamonte region in Colombia, these granulated coffee cubes combined with raw unrefined cane sugar dissolve in both hot or iced water and come in a variety of intoxicating flavors: classic strong, classic, mocha, hazelnut, caramel, french vanilla, and caramel hot chocolate. Individually wrapped and travel-friendly, these vegan, gluten-free, all-natural flavor cubes are the simple way to enjoy a superior cup of joe on the go. Made in Colombia. Use one cube per every 8 oz. of water or milk. For a hot beverage, heat milk or water until desired temperature. Insert cubes and after 30 seconds, stir. There are 4 cubes of each flavor and 24 cubes in total. This product was a gift for my boyfriend, who frequently doesn't have time to make coffee before he leaves for work. He can make this coffee at work in just a couple minutes. The price is very reasonable considering that it will make 24 cups of coffee in six different flavors. I got this gift for my caffeine addicted boyfriend. It comes with 8 different types of coffee blends and each "cube" is the size of a bigger box of raisins. I did not think it would be that big, but that was a nice surprise! It was wrapped in plastic material and tied together with a nice straw bow. They've made it very easy for me to gift it. I am tempted to steal one, but there is no way I would be able to write it quite so nicely. I ordered this product as a gift for my husband who travels quite a bit and doesn't always have time to go down to the hotel's breakfast bar. He loved it! It make a perfect cup, his favorite is caramel. The packaging is really pretty and the flavors are above par. When we ran into a little problem about one of the flavors not being in stock at the time of the order, these people did right by me and not only sent the missing flavor after the original order was shipped, but kept in constant contact with me, sending additional product for my troubles. I would order from them again...and again. Nice packaging. I haven't used them, yet. Too nice to open, but I will. The product maker apologized that only sold in packages of three not four as advertised. Offered option to send the extra one or even more on a future order. I choose to take the fourth to try product before ordering more. Very nice and caring company. I received all four and a nice note on the box to enjoy. This is great secondary customer service. I am expressed with both Uncommon Goods and this coffee supplier company. Thanks. I was so excited to try this product, but was disappointed only to find out all the coffee cubes are already blended with sugar. I unfortunately do not like sweetened coffee. I must have overlooked that important detail in the product description. Thankfully I have friends who do and can make it into a gift for someone.